DeSaltus is a polymaleic acid formulation that removes sodium from the rootzone, minimizes soil compaction, and allows for greater root development. 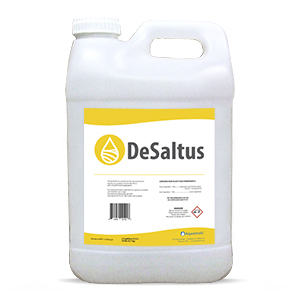 DeSaltus promotes increased water movement into and throughout the soil profile and promotes good soil aggregation, correcting the negative impact of mineral salts that may interfere with seed germination and root growth. DeSaltus increases the solubility of applied and naturally-occurring calcium, so that it becomes incorporated into the soil more completely. This increases aggregate size, creates pore space, and improves the overall soil structure (right). A DeSaltus program used in conjunction with regular calcium applications will help to improve soil aggregation, increasing soil porosity for enhanced water infiltration and gas exchange. By improving salt and nutrient movement through the soil with DeSaltus, growers can improve nutrient efficiency and overall plant productivity. For more information about DeSaltus, including pricing and availability, contact your local Aquatrols distributor today!